Despite the slow and uneven recovery from the global economic downturn and lingering high levels of unemployment in many markets, organizations around the world still report that they cannot find the talent they need when they need it. According to ManpowerGroup’s 2011 Talent Shortage Survey, one in three employers globally report difficulties filling positions due to lack of available talent—a slight increase since 2010. Talent is becoming the key competitive differentiator, and companies with access to the right talent are working to position themselves to succeed in the rapidly changing world of work. Social media can especially be a powerful resource for recruiters, yet in the majority of organizations, recruiters are not getting the training they need to be successful at finding the right talent for their organizations. Learn how Intuit Right Talent created a holistic social media strategy that recognized them as the second most social company in 2011, ahead of companies like Google, Amazon, and Apple in order to create a social media strategy to reach your recruitment goals and help your organization stay on top of finding the right talent. Healthcare candidates are one of today’s most competitive talent markets. In order to attract and retain these candidates, employers need to understand their job search preferences and motivators for career change. During this webinar, experts from ManpowerGroup Solutions and the Boston University School of Medicine will discuss the evolving healthcare marketplace as well as new workforce and recruiting strategies — and how this is raising the bar for patient care. * Please note this webinar is not eligible for HRCI credit. Whether you’re investing in a global initiative or just want to better understand global trends, this complimentary TAPFIN webinar will provide expert insights to help navigate you to success. We’ll share our latest Quarterly Market Report – an analysis of current trends, opportunities, global market indicators and considerations for tracking talent globally, with an emphasis on how these market conditions can impact hiring activity and business outcomes. The webinar will also provide insights into which market dynamics have the most impact on workforce activity and how best to measure that workforce activity within your organization. This quarter, we will be joined by Subject Matter Experts in diversity hiring to discuss how perspectives and objectives shift by market and by industry, highlighting some of the best practices and solutions to achieving desired outcomes. As organizations increasingly recognize their global workforce as means to improving business performance and efficiency, it is important to have visibility into what is happening both inside and outside of your organization with regard to workforce activity and performance. Subject Matter Experts Vincent Rossy, CEO of CorTech LLC and Paul Neto, VP of Global Staffing Services will join us for a discussion on driving competitive advantage through workforce analysis. We’ll share our latest Quarterly Market Report – an analysis of current trends, opportunities, global market indicators and considerations for tracking talent globally, with an emphasis on how these market conditions can impact hiring activity and business outcomes. The webinar will also provide insights into which market dynamics have the most impact on workforce activity and how best to measure that workforce activity within your organization. As organizations increasingly recognize their global workforce as means to improving business performance and efficiency, it is important to have visibility into what is happening both inside and outside of your organization with regard to workforce activity and performance. Subject Matter Experts Mikey McPhail, Director of Business Intelligence at ManpowerGroup Solutions and Dave McGonegal, VP, Strategic Client Solutions at ManpowerGroup Solutions, will join us for a discussion on driving competitive advantage through workforce analysis. + How workforce productivity and performance shifts globally. + How different views of your workforce data can yield new insights. + How you can compare your workforce to the market to identify opportunities and challenges. We’ll share our latest Quarterly Market Report – an analysis of current trends, opportunities, global market indicators and considerations for tracking talent globally, with an emphasis on how these market conditions can impact hiring activity and business outcomes. The webinar will also provide insights into regional considerations that can impact the best approach to sourcing and hiring talent. As organizations increasingly recognize their global workforce as means to improving business performance and efficiency, it is important to understand how hiring requirements and processes need to be adjusted due to cultural and market dynamics. Subject Matter Experts Brian Hoffmeyer, VP of Product Marketing at IQNavigator and James Winter, Director of European Process Excellence at TAPFIN, will join us for a discussion on regulations and trends impacting global workforce strategy. + How workforce utilization is shifting internationally. + How regulations impact best practices to achieve your hiring objectives. As organizations increasingly recognize their global workforce as means to improving business performance and efficiency, it is important to understand how hiring requirements and processes need to be adjusted due to cultural and market dynamics. Subject Matter Experts and VPs at ManpowerGroup Solutions, Lisa Schiller, Dave McGonegal, and Jon-Ray Rivera will join us for a discussion of best practices in workforce strategy and sourcing models. +How the availability and migration of skills impacts hiring activity. +How market conditions influence the outcomes of various sourcing models. +Which hiring strategies will drive results for your business in various parts of the world. Today’s MSP solutions are very different from the contingent workforce management programs of the past decade. Join ManpowerGroup Solutions TAPFIN for a discussion on how MSP’s have evolved from a narrow focus on temporary and contingent workers into a management framework that provides control and visibility into your entire non-employee workforce. We will discuss the underlying trends propelling the evolution of MSP solutions, the emerging areas of focus for next generation MSP solutions, and the core competencies MSP’s must develop to keep pace with changing client requirements in an era of ongoing uncertainty. We’ll share our latest Quarterly Market Report – an analysis of current trends, opportunities, global market indicators and considerations for tracking talent globally, with an emphasis on how these market conditions can impact hiring activity and business outcomes. The webinar will also provide insights into regional considerations that can impact the total cost of labor. As organizations increasingly recognize their global workforce as a means to improving business performance and efficiency, it is important to understand how regulatory requirements and organized labor can influence the effectiveness of workforce strategies. Industry experts Jeff Nugent, managing director of Contingent Workforce Solutions and Dana Shaw, COO of ICon Professional Services, will join us for a discussion of best practices in workforce compliance. • How shifting workforce regulations impact requirements and strategies for I/C management. • How industry labor trends and organizations affect hiring practice and workforce engagement. • Which trends represent the most risk or the greatest opportunity for your business. Building a recruiting operation with global delivery capability can be a daunting prospect. From organizing the operation and training the team to factoring in cultural and legal differences and choosing a technology to support it all, there are several factors to account for when setting up your global recruiting framework. Top talent has become more and more challenging to find. And, without an effective strategy that meets your unique business needs, the ramifications may be significant. Finding the talent you need requires an integrated approach for both attracting new talent and building top talent internally. Businesses need to be flexible, aligned, and talent focused today in order to respond with speed and agility to rapidly changing market conditions. Which means they must get organized and aligned ahead of time. To attract the right candidates, organizations need to create the optimal sourcing channels and delivery methods to meet critical business objectives. By participating in this complimentary webinar, you will learn how smarter talent sourcing can give you improved visibility to talent pools, enhance identification of quality, hard-to-find candidates and enable you to deploy the right mix of resources to meet business objectives. • Leveraging technology platforms to provide analytics and deliver greater workforce insights. • Identifying the right workforce mix that is unique to your business. • Optimizing your supplier strategy to deliver deeper cost advantages and improved program quality. • Integrated resource models that equip you to quickly, efficiently and successfully acquire key talent. Whether you’re investing in a global initiative or just want to better understand global trends, this complimentary TAPFIN webinar will provide expert insights to help navigate you to success . We’ll share TAPFIN’s latest Quarterly Market Report analysis of current trends, opportunities, global market indicators and considerations for tracking talent globally, with an emphasis on how these market conditions can impact hiring activity and business outcomes. The webinar will also provide regional insights into workforce availability, capability and cost by industry. Multinational companies are faced with the growing challenge managing an increasingly diverse workforce with different nationalities, languages and cultures. Lack of HR communication consistency across locations can lead to P&L challenges, difficult integration and ultimately impact global growth. Learn about best practices for addressing common challenges by using language and culture, or HR Localization, to create effective local strategies within a global context. • How shifting workforce regulations impact requirements and strategies at the regional level. • How industry labor trends and cultural nuances affect hiring practice and workforce engagement. • How to balance global policy communication with local workforce expectations. • How a global strategy that embraces local language and cultural differences can be more successful. • How talent can help make language a tool that drives greater integration and business growth. Whether you’re investing in a global initiative or just want to better understand global trends, this complimentary TAPFIN webinar will provide expert insights to help ensure your success. We’ll share TAPFIN’s latest Quarterly Market Report (QMR) to provide a current analysis of trends, opportunities, global market indicators and considerations for tracking talent globally, with an emphasis on skilled labor in the European Market. The report will also provide insights at the regional level into workforce availability, capability and cost, as well as regulatory dynamics and market conditions. • How shifting workforce regulations are impacting requirements and strategies at the regional level. • How industry activity can be aligned to specific talent gaps and availabilities. • How skilled labor trends and education can be used to identify emerging talent markets. • The costs associated with contingent workforce engagement by region. • An introduction to forecasting global talent mobility. A panel of European Business Leaders will provide insight into local market trends and dynamics to provide regional insight and support workforce planning activities. Tax risk extends well beyond the financial statement impact. In today’s complex business environment, organizations must take a closer look at their tax risks to ensure there’s a solid framework in place to identify, measure and control risk and opportunities consistently and cost effectively. Join us to learn ways to improve the audit of tax risks in your organization. This session will be led by two members of the Experis leadership team who have extensive experience in corporate taxation and internal audit. • Explain how to identify and assess potential tax risks faced by many corporations. • Discuss strategies to ensure effective risk oversight. • Outline solutions internal audit departments can employ to better manage tax risk. Whether you’re investing in a global initiative or just want to gain further understanding of global trends, TAPFIN’s upcoming complimentary webinar can provide expert insights to help ensure your success. The webinar will refer to TAPFIN’s latest Quarterly Market Report (QMR) to provide a current analysis of emerging trends and new opportunities. Along with global market indicators, this session will highlight considerations for tracking talent globally, with a particular emphasis on skilled labor. 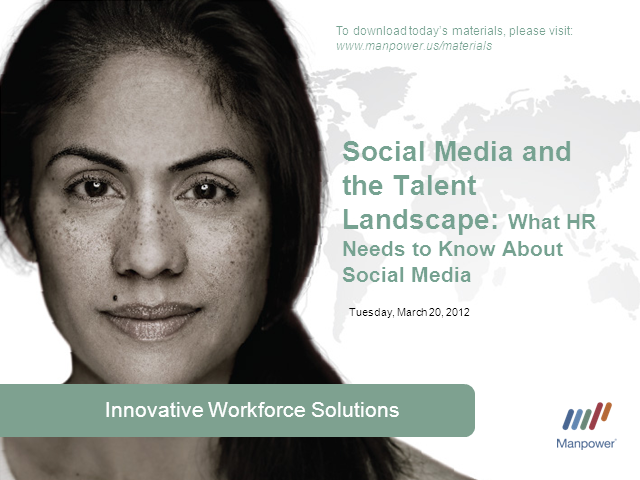 Through a comprehensive review of current talent trends, including how education can be used to identify emerging talent markets, as well as an overview of how industry activity can be aligned to specific talent gaps and availabilities, this webinar will provide a macroeconomic overview of current skilled labor trends and provide an introduction to forecasting global talent mobility. As always, this report provides insights into the latest opportunities and challenges at the regional level, and reviews the implications of workforce availability, capability and cost, as well as regulatory dynamics and market conditions. Tactical and strategic considerations of going global will be discussed, with a focus on current skilled labor trends. • An in-depth analysis of how shifting workforce regulations are impacting requirements and workforce strategies at the regional level. •A regional comparison of costs associated with contingent workforce engagement. • A strategic overview of current skilled labor trends. • An introduction to forecasting talent mobility worldwide. As organizations prepare to implement many provisions of the Patient Protection and Affordable Care Act, they are also faced with having to manage continually changing facets of the legislation. In the third installment of our Health Care Reform webinar series, we will examine the changes and implementation of the Patient Protection and Affordable Care Act since the 2012 election and its continued impact on workforce strategy and talent supply. With the longest tenured Managed Service Provider (MSP) programs approaching 15 years of continuous successes and with the vast majority of MSP opportunities in the U.S. market addressed, many organizations are working with their MSP partners to advance the capabilities, efficiencies, breadth, and depth of their MSP programs. By participating in this webinar, you will learn how to optimize your MSP investment and generate sustained ROI while meeting increasingly demanding KPIs and business objectives. - Extending the MSP Program, including services procurement management, global expansion and IC compliance. - Human Age and Integrated Resource Fulfillment, including upcoming market challenges, integrated resource fulfillment, and how MSPs are well-positioned to help clients reach their goals. Join ManpowerGroup for a complimentary webinar designed to provide insights into the 2013 talent shortage and what that means for hiring and your success. Organizations face an ongoing challenge finding the right people with the right skills – those who can improve performance, strengthen competitive advantage and drive sustainable growth. In fact, ManpowerGroup’s eighth annual Talent Shortage Survey revealed that U.S. employers are struggling to fill mission-critical positions, despite continued high unemployment. • Gain insights into factors causing the talent shortage and how it impacts your organization. • Find out which are the top ten hardest jobs to fill. • Learn why employers are having difficulty filling jobs and see how you compare. • Identify solutions for winning in today’s intense race for skilled talent. • Learn about the Human Age and the forces of change that are transforming the world of work. Management Systems (VMS) must be aligned with corporate initiatives to facilitate workforce management internationally. With the key implementation dates of the Health Care Reform law fast approaching for employers, organizations are trying to quickly understand the impacts and develop plans to comply, as well as address key concerns. As companies evaluate the effect on their workforce strategies, an understanding of how the contingent marketplace may change will be essential. In this webinar, we will cover several key topics that will help companies understand the impacts of Health Care Reform and how that may affect their supplier dynamics. Expanding your global contingent workforce program involves more than just looking at ever-changing market conditions and challenges. Knowing how your corporate priorities and business objectives will impact your program is also critical to ensure its success. With so many key areas to consider, how do you achieve the right balance and best benefit your business? TAPFIN’s complimentary webinar, Global Expansion: Balancing Strategic Priorities, will review best practices and analyze the five-year trend of the Managed Service Provider (MSP) market to offer insight into how your priorities will impact your program growth. Emerging markets will also be evaluated for opportunity and viability of expansion. Join ManpowerGroup™ North America's Chief Legal Officer Mark Toth for a complimentary webinar about Leadership. In this engaging and interactive webinar, Mark will share simple, yet powerful tools you can use right now to identify and grow leaders in your organization, become a better leader yourself and avoid critical leadership mistakes that could land you in court (and maybe even jail). The ManpowerGroup suite of solutions is offered through ManpowerGroup Solutions, Experis™, Manpower® and Right Management®. ManpowerGroup Solutions provides clients with outsourcing services related to human resources functions, primarily in the areas of large-scale recruiting and workforce-intensive initiatives that are outcome-based, thereby sharing in the risk and reward with our clients. Our solutions offerings include Talent Based Outsourcing, Managed Service Programs, Borderless Talent Solutions and Recruitment Process Outsourcing, where we are one of the largest providers of permanent and contingent recruitment in the world.